Something To Your Advantage, by Mabel McCarthy. It’s the oldest joy in the book, and the oldest worry too – a letter turns up out of the blue. 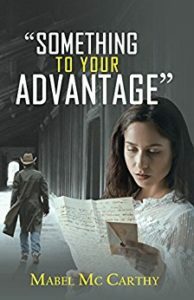 When Virginia Coles gets a letter promising her ‘Something To Your Advantage,’ it kicks off a trail of events that change her life forever. Mabel McCarthy’s debut novel, published by Austin Macauley and out now, first came into our inbox a couple of years ago, and was definitely something to our advantage when we read it. Now you can get that lucky too. Get Something To Your Advantage at Amazon today and immerse yourself in the world of post-war Britain. A world of good and bad relationships, legacies, lies, friendships and personal courage, that will stay with you long after you close the book. A phoenix from the flames of NaNo? A hearty congratulations to all this year’s NaNoWriMo winners – and also those who tried but perhaps didn’t quite reach the 50,00 NaNo word count during November. Good sense demands that you should all be putting your NaNo work away for a month now, to get the necessary distance on it to see it with fresh and honest eyes when you come to redraft. But in case having done this year’s NaNo, you’re feeling a bit deflated about the actual creative value of the process, we spoke to Julie Emovon, who took the NaNo Challenge just two years ago – and has recently seen her NaNo novel, Eternal Flame, published. Hi Julie. What made you decide to commit to the NaNoWriMo Challenge? NaNo was something I had wanted to do for a couple of years, but I always managed to find some reason I couldn’t. It was either work, or the kids, or something. 2013, the year I wrote Eternal Flame, was actually the first year I committed to the idea. I have always written for fun, I have about a dozen ‘novels in progress’ on my hard drive, but life tended to get in the way of finishing. If procrastinating was an Olympic sport, I would be up there on the podium! However, I know from studying that I work better when I have definite targets and time scales, rather than ‘sometime.’ NaNo helped me focus on the process because I had a goal to aim for. What made you think Eternal Flame was viable as a book to write in a month? Where did the ideas come from? A germ of the idea had been in my mind for a couple of years, but in a slightly different form. My first idea was a time travelling phoenix/human hybrid, who accidently infected a human with a virus that caused him to become a phoenix, who then travelled through time trying to find her. I had read lots of myths about the phoenix and firebirds from different traditions which kind of merged into one. I decided to follow the Slavic mythology as the main theme, but I do touch on a number of traditions along the way. I didn’t know if I could do the whole thing in a month, but I knew I had a reasonable plan to follow by the end of October, which would help facilitate the writing. Usually I tend to be a pantser, with minimal planning before hand. This time though, I had key points to hit along the way and a rough guide of word count for each section. I don’t think I honestly expected to achieve a finished novel in 30 days, but I knew I would have a 50,000 word base to work with. Had you been published before? What, how and with whom? Eternal Flame is the first novel I have published. Previously, I have had short stories published in local anthologies and magazines. I have also had a few poems published, in newspapers, magazines and such. I had a few published in a ‘gothic’ magazine, which can be read here. Did you envisage Eternal Flame going the same route? My ideal would have been to get a publishing deal in the traditional way, but over the last couple of years, I had begun to consider self publishing as a viable route. When I thought about submitting, I had assumed it would be first three chapters to agents and publishers and hope for the best. The reality was quite different to that. Tell us about how you managed to write it. What pitfalls did you encounter, and how did you keep the discipline? The first few days were quite easy to reach the word target, I was fired up and determined that this would be it. About the 14 day mark, I felt like I had hit a brick wall. I had exhausted the scenes I had in my head, got the basis of the legends down and had introduced my main characters. The exciting but was done, and now I had to fill in the missing bits. I has about 30K written at that point, which is a good chunk of writing in 2 weeks. It was about this time that everyday life began to interfere as well, with people who had been supportive of the idea complaining about how much time it took up. I took a couple of days off, then set myself a strict routine of writing time, and allowed myself treats if I hit my word count. At about this point, the plot took quite a dark, drastic twist from my original rather sweet love story. All of a sudden I knew how to finish. Once you had the manuscript, what then? I had a couple of people who offered to be beta readers and offered some ideas on how to make the narrative smoother. I am also a member of several writing groups online, where I posted a couple of chapters for feedback. This helped focus me on what worked and what did’t. Then it needed a bloody good edit, mainly due to me concentrating on quantity over quality for the first rushed draft. This is where you came in. A couple of rewrites later, I felt that it was time to submit, see how it went down with people who mattered. The story got darker in the rewriting process I think. I learnt that as a writer I don’t always have to play nice. I think this makes the story stronger and more interesting than my original premise. How widely did you submit? Agents? Publishers? Any idea how many? When the time to submit came, I opted for something I had heard about for the first time in the NaNoWriMo forums, a Twitter pitch. I attended a Twitter pitch party with a couple of writer friends. The principle being that on the set day, agents and publishing house reps made themselves on Twitter using the relevant hashtag. Authors get to pitch their novel in 140 characters, once an hour. If an agent or publisher was interested in your manuscript, they’d respond to your tweet with a request to see your novel. That was an amazing experience. It allowed authors to get a quick idea of how their manuscript was being viewed in the industry, without the usual long wait for responses to submitted manuscripts. It also put your pitch in front of over 100 agents and publishers in just a couple of hours. Can you imagine what it would have taken in time and resources to be put in front of so many people in the old days? What happened? Who was it that said yes to Eternal Flame? And on what sort of deal? What advice would you give to help writers follow in your footsteps and go from NaNo to published? I would say don’t worry if anyone but you will like it, just get it down. This is what NaNo does, enables you to turn off your inner editor and just throw it all out there. Experiment with finding your voice. Once you have completed your novel, let people read it and give you feedback. This can feel like standing naked in the high street at first, but it does get easier. Listen to the excuses you are making to avoid committing yourself to the challenge. This has been a challenging year for me, but I know I will complete the 50k. I am using voice recognition software to mitigate the aching fingers and eyes. I have put my novel on a website called novlr.org, which allows you to have access to your work in progress on any computer, and even on your phone. I spent an hour in a doctor’s surgery waiting room this morning, adding to my latest word count on my phone, which was then synched with my laptop. I can throw out a hundred word in my break at work, and when I am too exhausted to type, I take my laptop up to bed, turn on the voice recognition and turn off the light while I lay and dictate. It is easier to write a novel and get it out there now than at any other time in history. Make use of all the technology and social networking you can to help you with the process, feedback and reaching the goal of seeing a book with your name on it on your shelf. 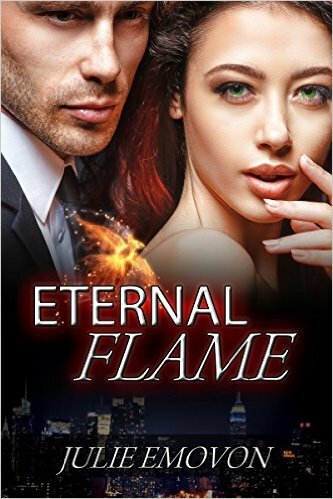 To check out Julie’s successful NaNo novel, Eternal Flame, go to Amazon right now.